"Sand as white as snow swirls like smoke around my feet"
A sandy cove with rockpools which is backed by low cliffs. Located down a quite country lane, this beach is absolutely fantastic for spotting some of the UK's most colourful shore life. 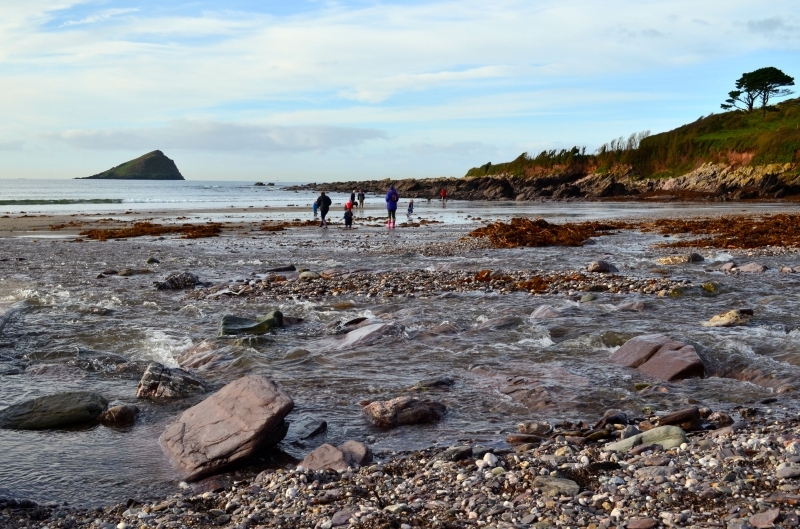 Wembury marine centre also hosts rock pool rambles for kids during the Summer. Wembury Beach is on the South Devon Heritage Coast, and adjacent to the South West Coast Path. The tide at Wembury Beach is currently rising. High tide will be at approximately 9:46 AM, and the next low tide will be at approximately 4:02 PM. There are approximately 150 car spaces available for a charge. Dogs not allowed May to the end of September when a seasonal ban is in place. around 2 miles northwest as the seagull flies, around 5 miles by road. around 4 miles northwest as the seagull flies, around 8 miles by road. Visitor information for Wembury Beach, Devon, England. Weather, tides, visitor comments, beach facilities, photos, nearest postcode, beach information and nearby accommodation.